Mexican cartel chief Joaquin „El Chapo“ Guzman was found guilty in New York City on Tuesday. The verdict comes after 11 weeks of testimony from high-profile cartel figures and law-enforcement officials. The case revealed an array of sordid details about the Sinaloa cartel and about Guzman himself. After six days of deliberations, jurors in New York City returned a guilty verdict in the trial of Sinaloa cartel kingpin Joaquin „El Chapo“ Guzman, finding him responsible for all counts of an indictment that included drug-trafficking, conspiracy, and use-of-firearms charges. Guzman now faces a mandatory minimum of life in prison. He will be sentenced on June 25. The verdict comes after 11 weeks of arguments and testimony — just 30 minutes of it from the defense — in federal court that released a torrent of sensational accusations implicating nearly every level of Mexican law-enforcement and politics, including the country’s current and former presidents, in criminal activity. The narcos and law-enforcement officials who took the stand during the trial revealed a litany of sordid details about the Sinaloa cartel’s operations and about the violent, decadent, and sometimes perverse proclivities of Guzman, 61, who is believed to have been the organization’s main leader for much of the past two decades. The defense tried to cast Ismael „El Mayo“ Zambada, who is seen as Guzman’s peer at the top of the cartel, as the organization’s mastermind. The elder Zambada has never been caught, but one of his sons, Vicente, testified against the capo he was once poised to succeed, revealing details about jailbreaks, massive smuggling schemes, and widespread corruption. Another witness, Hildebrando Alexander Cifuentes-Villa, a Colombian drug-trafficking scion, added to the tales of bribery, alleging that Guzman paid $100 million through an intermediary to President Enrique Peña Nieto, whose six-year term ended in December. A representative for Peña Nieto denied the allegation, as did his predecessor, Felipe Calderon, who was implicated alongside Peña Nieto during the trial’s opening arguments. Cifuentes also told the court of Guzman’s cinematic aspirations, saying that Guzman was interested in having a movie made about himself as early as 2007 — long before his mountain-hideout meeting with Sean Penn. The Sinaloa cartel is not a hierarchical organization; at times the factions of which it is comprised were at odds with each other. A constant backdrop to Guzman’s exploits was violence with partners as well as rivals. Guzman clashed with members of the Beltran-Leyva family, to which he was related, the Arellano-Felix Organization, and other former partners. Those fights helped push bloodshed in Mexico to record levels. The case — particularly the government’s evidence — revealed Guzman’s paranoia. The kingpin used spyware against friends and enemies, listening in on the calls of lovers and associates. Some of those recordings were played in court, as the technician who set up Guzman’s eavesdropping system agreed to cooperate with the US, turning over calls and text messages. The trial also revealed more about the person who is perhaps closest to Guzman, his wife, Emma Coronel Aispuro. 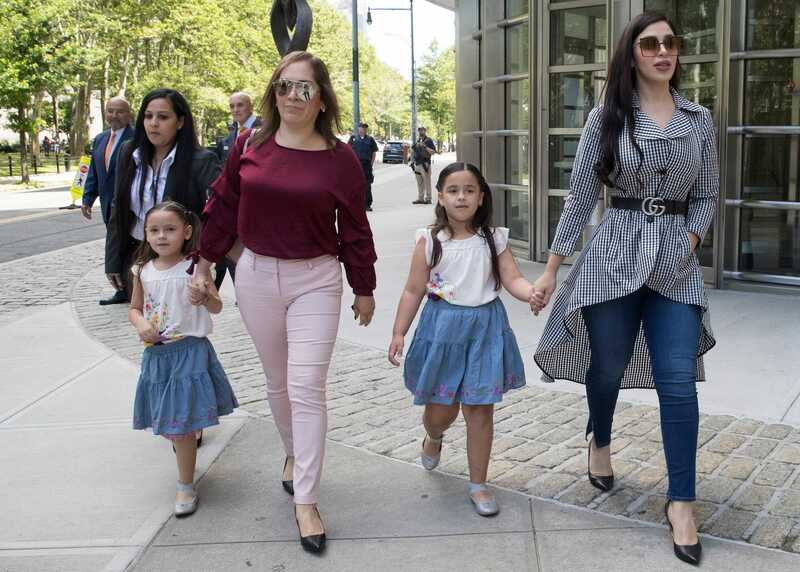 Three decades younger than Guzman, she is the mother of two of his children and has been a constant presence in the courtroom, even during testimony by her husband’s mistress. Guzman and Aispuro appeared to revel in that moment, wearing matching outfits to court. Aispuro’s role in the the cartel’s operations was also fleshed out. According to the testimony of Damaso Lopez Nuñez — a Mexican security official who became Guzman’s right-hand man before clashing with Guzman’s sons for control of the cartel — Aispuro was the main intermediary during the planning of Guzman’s second jailbreak, carrying messages between the imprisoned cartel leader and plotters who were constructing a mile-long tunnel under his cell. Aispuro has never been charged with a crime, but her alleged complicity appears to clarify some of the strict security procedures in place around Guzman. She has not been able to contact Guzman while he’s been in US custody — at the beginning of the trial, the judge presiding over the case turned down a request to allow her and Guzman to hug in court. Guzman remains highly regarded on his home turf in Mexico — a reputation earned through a mix of intimidation and largesse. The cartel he help build appears solidly in the hands of his sons and erstwhile partner, Zambada, after months of fighting for control of it in the wake of his capture. But in the US, Guzman now faces a life sentence, which he will likely spend at the supermax facility in Florence, Colorado, a maximum-security prison described as „much worse than death“ by a former warden. Inmates at ADX Florence are highly segregated, but the prison holds a familiar face: Osiel Cardenas Guillen, one-time leader of the Gulf cartel who was extradited to the US in 2007 and sentenced to 25 years in 2010. He cooperated throughout his time in custody and could be released as soon as 2025, before he turns 60. Gulf cartel cofounder Juan Garcia Abrego spent 20 years at ADX Florence before he was transferred to a high-security prison at the same facility.